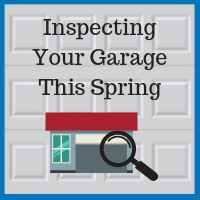 Overhead garage door: Use our garage door maintenance checklist, and be sure to lubricate the garage door springs. Also, check flexible door seals for signs of mouse damage and replace the seals as needed. Windows and entry doors: Spring is a good time for window washing and wiping down entry doors. While cleaning, check for any signs of rot around window sills and door sills. Inspect caulk that protects against water infiltration around doors and windows, and repair it as needed. Check the weatherstripping as well. Roof: See our article on roof replacement for tips on how to tell when your roof shingles are wearing out and may need replacement. Soffits and fascia along edges of the roof: Check soffit vents and clean as needed to ensure proper air flow. Check the soffits and fascia for signs of rot or any gaps or holes that could allow entry by insects and other pests. Seal any gaps or holes with metal mesh (e.g., quarter-inch hardware cloth), which can then be covered with caulk. Remember that mice can squeeze through a quarter-inch hole. Gutters: Make sure gutters are clean and drain properly. Seal any joints where water drips out. Walls: On the interior of the garage, check the wall framing where it meets the concrete foundation for signs of moisture or rot. Also, look for signs of insects or mice and apply pesticides as appropriate. On the exterior, check for any missing or damaged siding that needs repair. Floor: Chicago winters are hard on garage floors. Unless you have applied a waterproof sealant, water that sits on your garage floor will work its way into the porous concrete. When the temperature dips below freezing, that moisture in the concrete expands and causes the concrete to start flaking apart. The resulting unsightly blotches of crumbling concrete are known as spalling. This type of floor damage can be repaired with either an epoxy-based concrete patching compound or a polymer-modified cement. After making the necessary repairs, you may want to protect the floor from future spalling or pitting by applying a sealant. Exterior plants: Keep plants and bushes trimmed back at least one foot away from all home and garage walls. Trim trees so that branches are at least six feet away from the house. Are you ready to repair, expand, or replace your garage? Call the Downers Grove garage professionals at Blue Sky Builders at 630-852-8485 for a free estimate. We provide quality work at an affordable price.